Heightened expectations and high risk were the rule of the previous series, series 5, of Doctor Who. The beginning of the reign of showrunner Steven Moffat (Coupling, Sherlock) promised great change, though for good or for bad, we did not know. You might then expect something similarly revolutionary for series 6. Once you've had a taste of just how good things can be, as I have previously described series 5, you might feel deep satisfaction, followed by ennui, and then you try to make it happen again. But this time, the new boss is the same as the old boss. Series 6 is certainly worse in some ways than 5, but it is quite possibly much better in the exact same ways. Let's call it an evolutionary process, whose outcome is not yet known. You can tell right away, and will be reminded periodically, about the changes in this series, so much more notable for their insignificance. The series opens with a big two-parter ("The Impossible Astronaut" and "Day of the Moon"), brimming with aplomb such as is usually reserved for the grand finales that the new series (series 27–) has become known for. Big! Things! Happen! And the only subdued elements of the early exhibits in this grand show are unsurprisingly the cleverest: the newly introduced enemies — and Moffat has always been good at memorable enemies — and, for whatever reason, Richard Nixon. The same can't be said of the intentionally trivialized Adolf Hitler depicted half a season later. Following up mid-series finale "A Good Man Goes to War", a study in quality Sorkinesque speechifying, "Let's Kill Hitler" threatens you with a sense of unease unrelated to its title matter. It's an idea parade — really, more like an idea train, with you being pushed on the tracks, and a conductor both unable and uninterested in saving you. Writer Moffat pays back a season and a half of plot buildup in a very short space, and I can't say I'm pleased with the answers we got, particularly given that we were promised much more in the preceding few episodes. Some of the charm loaned out in "Let's Kill Hitler" is paid back by the finale, "The Wedding of River Song". It's worth comparing to last season's finale, "The Big Bang". Both featured the Doctor (Matt Smith) in an extended flight of whimsy, seeming in his element with the world falling apart around him, waiting for him to save it. In both cases, the whole universe was at stake, and self-sacrifice seemed to be the only way out for the Doctor. However, where "The Big Bang" inverted its style suddenly to become very personal, viewing the universe's destruction as a test of Amy Pond's (Karen Gillan) connection to the Doctor, "The Wedding of River Song"…does not. Not giving too much away, the tropes of Leverage came to mind — I would say Hustle if I could. Even the best Doctor Who season is not without its duds among the standalone stories that are the show's bread and butter, guilty not of ambition in excess of talent, but a conservatism not well-matched to the adventurous storytelling that makes up the best Who. This year, our case studies are "The Curse of the Black Spot" and "Night Terrors". Both inelegantly hinge on exploitation of the fear of Amy's or Rory's (Arthur Darvill) death and mimicry of Moffat's method of enemy design. But my favorite episodes of Doctor Who are not about myth-arc build-up or payoff. They are those that stand on their own, examining the nature of the Doctor, his relationship with his companions, and otherwise — in their little ways — advance the show's mission to understand itself as its own little universe. We have a stunning 3 such entrants in this series. "The Girl Who Waited" and "The God Complex", stirring the pot late-season just before the finale, focus on the psychological damage the Doctor's adventures can do to his companions. They are much more vicious in their indictment of the Doctor than the similarly-edged "The Vampires of Venice" last series. But "The Doctor's Wife" by Neil Gaiman (Stardust, Coraline) has the flavor of timelessness, setting aside our lovely companions of the day, Amy and Rory, in favor of the companion who has always been with the Doctor. Long after the events of this season warrant nary a mention, by the Doctor if not his followers in the real world, this episode ought to be remembered. 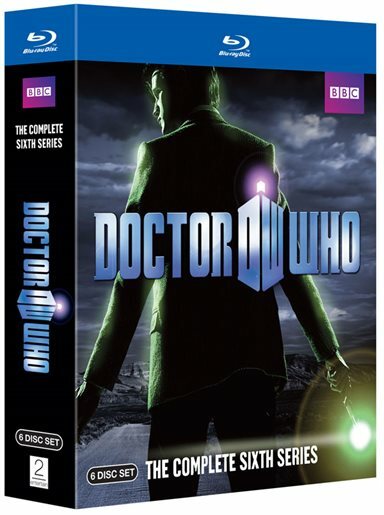 Download Doctor Who: The Complete Sixth Series from the iTunes Store in Digial HD. For more information about Doctor Who visit the FlickDirect Movie Database.